The CombBind C110 Binding machine features a binding capacity of 195 sheets and a punch capacity of 12 sheets. The C110 features the 'GuideRight' alignment facility ensuring a more perfectly aligned punch. This binding machine binds A4 and A3 portrait sheets only and the lightweight design allows for easy portability for professionals on the move. 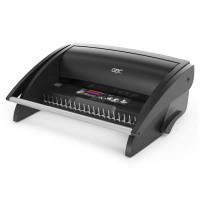 Comes with a full width handle to make paper punching easier.